With a name like this, you can imagine what I’m running. Finally, the chance for this epic card to get a chance to shine. This team is built around the use of Grodd with Hall of Doom. Yep, that same card that didn’t work out that well last week. Hey, there had to be better shenanigans, and I think I found it this time: use Hall of Doom to field Grodd at end of turn. This means that Grodd does not force my stuff to attack, since he’s fielded after attackers would be declared. Then, my opponent has to attack me on their turn, while I still have all of my stuff active. The goal is to then finish them off on the following turn by attacking with everything, when they should have no active characters left. 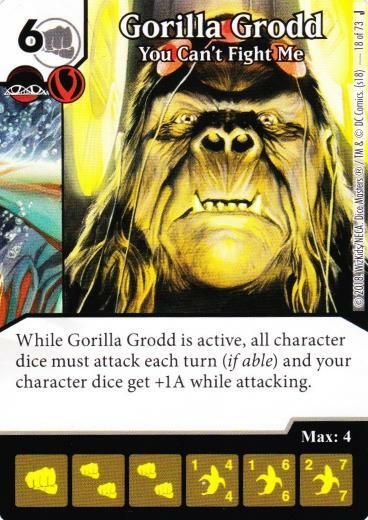 Add to that the +1A buff that Grodd gives my stuff, and it’s easy to get enough damage to win. To make this work, I need a good ramp engine. 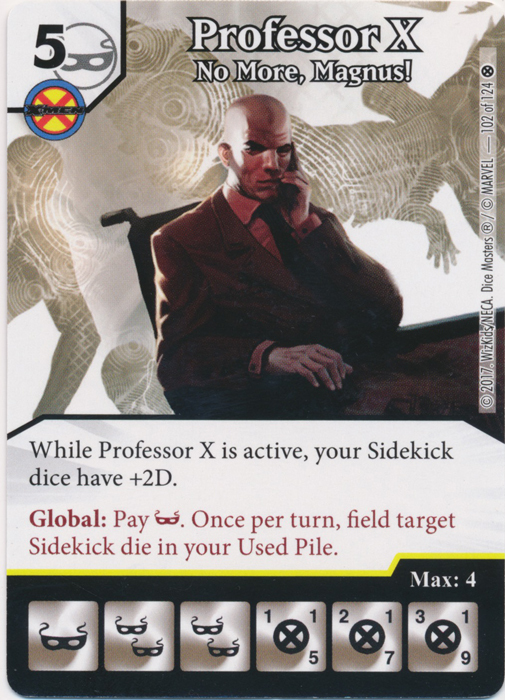 I chose to go with Mimic (with Professor X’s global). I’ve used that interaction before; field Mimic, name your sidekick, field tons of sidekicks, draw too many dice. Mimic is there for more than just ramp, though: after Grodd hits the field, I want Mimic to block and get KO’d…so that I can field him again, naming Grodd. Grodd’s substantially better stats should give me a big chunk of the damage I need to win. 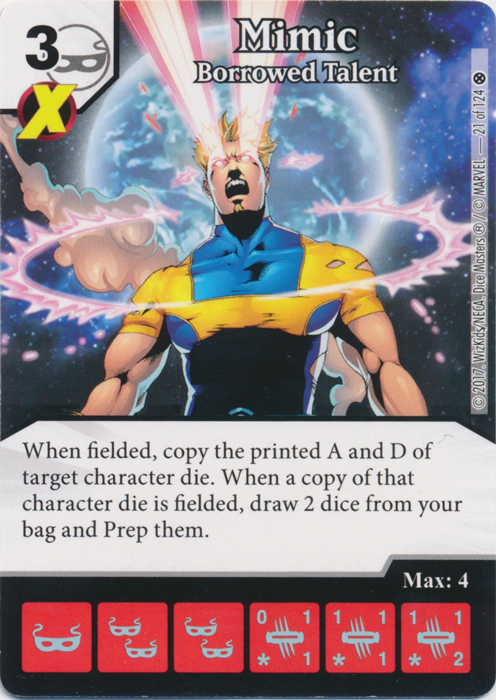 This, however, gives my opponent a chance to field a sidekick before my attack step thanks to Professor X. I thus need removal. Enter Jubilee and Venerable Dreadnaught; two options, one goal: do a bit of added removal. 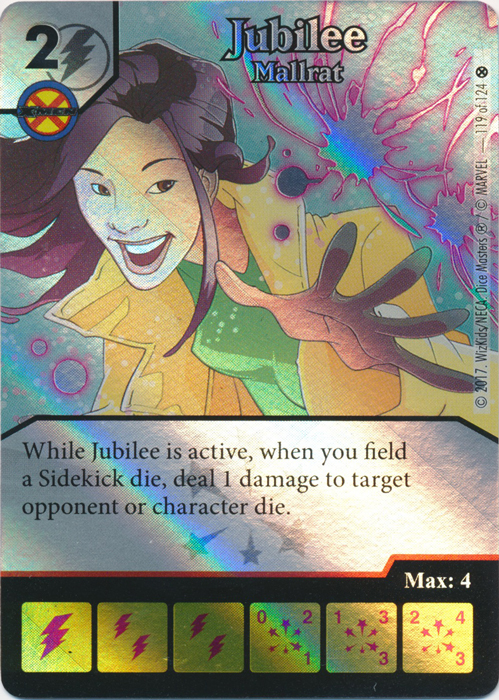 Jubilee, used with Professor X’s global, is also a good way to get Mimic off the field on my opponent’s turn (if there are no characters that Mimic could KO; after all, I don’t want my opponent to save blockers), to copy Grodd the following turn. Parasite and Scarecrow are two cards that I just wanted to mess around with, and since they’re Legion of Doom, they’re decent backup options if I roll Hall of Doom but don’t have the energy for Grodd. As for my BACs, Resurrection serves for ramp and bag control (especially early game, before Mimic shows up), and Smash is there for its global, to neutralize Overcrush (which has become way too prominent in my local meta). I started my evening against a Strike-based Justice League team. My opponent went for some big Overcrushing characters…good thing I brought Smash! Meanwhile, I was setting up my Mimic ramp while taking minimal damage. Eventually, I used Hall of Doom to bring Grodd in. 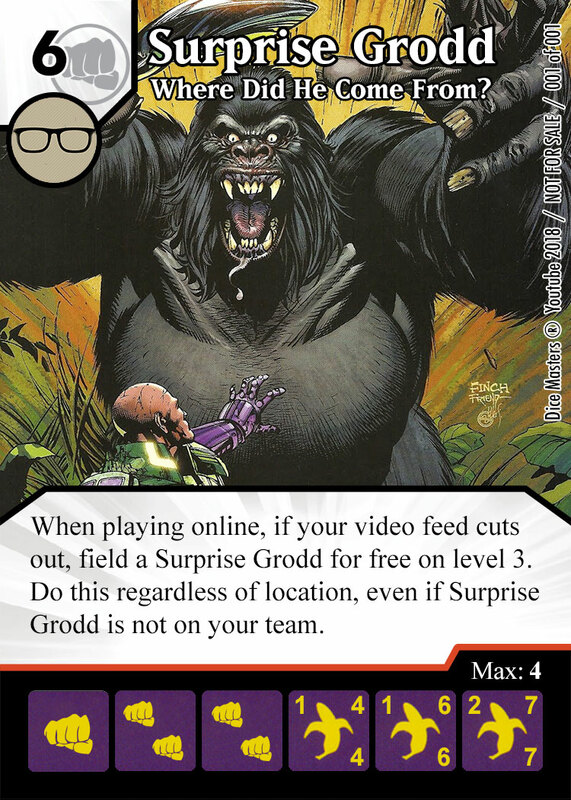 That’s when my opponent decided to read Grodd…and finally saw where I was going with this. After my opponent swung in (but used Parasite’s ability to keep it from attacking), I got to attack with more characters than she could stop, and I won. Next up, I went up against a pretty decent, but still casual X-men team. UC Jean Grey was his major control piece, but thankfully, Grodd has high enough toughness to get around Jean. I kind of felt bad about this matchup; he simply had no way to deal with my strategy. I got my Mimic ramp going before Jean showed up, and he hardly had time to set anything up before the Hall of Doom + Grodd combo fired off. He then had to swing in, I just let his characters through, and I got to attack with everything for massive damage the following turn. I won. Up against Mystics this time. This matchup was violent. Really, really violent. He went for his whole Boom Boom + Thrown Brick combo. I fielded Scarecrow early to keep Zatanna away. However, despite getting a metric ton of ramp, it was never the right time to buy Grodd. His Phantom Stranger wasn’t on the field, though, and my Dreadnaught was. All of a sudden, when I was looking at buying Grodd, I realized…I had lethal on the board (between Jubilee, Mimic, etc. ), and Dreadnaught could Range everything to death. So I attacked with everything, and my Surprise Grodd team won without Grodd. I finished my evening against C Hulk + Thanos. Well, that could’ve gotten ugly in a hurry…but it didn’t have the time to. I rushed to Mimic + Jubilee, my opponent Shrieked Jubilee (big mistake), I ramped like crazy, and my Grodd hit the field (via Hall of Doom) on Turn 5. My opponent was forced to attack with everything, and on Turn 6, my Mimic copied Grodd, and between Mimic, Grodd, Jubilee and sidekicks, I had more than enough damage for lethal. So I attacked with everything, won…and earned myself some glares from my opponent. -So I guess Surprise Grodd is a viable strategy? I didn’t have to deal with top-level control teams tonight, but seeing how well it did is intriguing me now. Could be even worse if I run Grodd with, say, Odin’s Fury. This could get ridiculous. -Scarecrow is not in the same league as Shriek. He’s decent if he’s bought early game, but he gets less valuable as the game goes on. Glad I tried him, but I don’t expect he’ll see much competitive use. So overall, for a team based on a joke, this combo should be taken seriously. Underestimate it at your own peril. 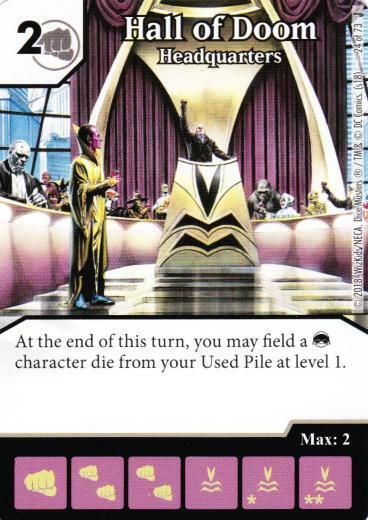 Posted in Constructed, Dice Masters, Team BuildingTagged Gorilla Grodd, Hall of Doom, Jubilee, Mimic, Parasite, Professor X, Resurrection, Scarecrow, Smash!, Venerable DreadnaughtcommentLeave a Comment on Look Out! Surprise Grodd!